As my eyes slowly opened, my mobile phones alarm screamed, yes it was 4.45am. I didn’t moan that it was so early because I was already feeling excited about my day ahead. I was about to start a day where one of my biggest dreams would be realised. This day I was heading off on my Horizontal Falls Tour. At the age of 19 years old I saw an Australian documentary by Malcolm Douglas on this part of the world and from that moment on I have dreamed of visiting the Horizontal Falls. Walking up to the reception office for my 5.20am pickup, I could feel the moisture of the night gently touching my face in the darkness. I was first on the bus and as we travelled around Broome to pick up the other travellers I wondered if they were as excited as I was about our morning’s adventure. Once at the airport luckily all the fog had lifted and there our 12 seater seaplane was waiting for us to board for our one hour flight to our destination. I was the only person travelling alone and I really hoped the pilot would ask if anyone wanted to sit in the co-pilots seat up front. After asking one man if he was travelling alone, which he wasn’t, he turned to me and said “Davine you are travelling alone, would you like to sit in the co-pilots seat”. Well I answered YES so quick I think the other passengers almost jumped. Even though he told us the first 30-45 minutes would be pretty boring, I didn’t find that at all. 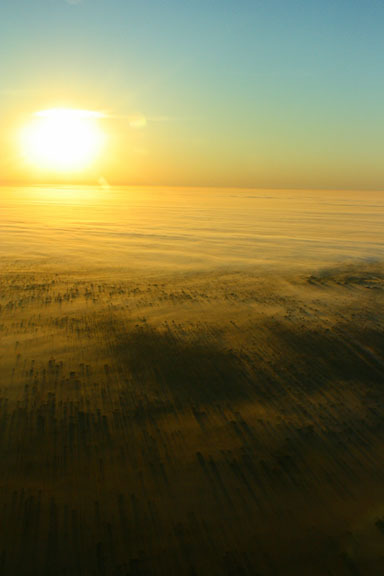 Just after take off and flying low over the Broome outskirts, the glorious sun rose on the horizon and all the light fog below radiated out from the suns glow. Finally after an hour our pilot Greg announced we were approaching the Horizontal Falls and we would fly over the two of them first before landing on Talbot Bay. My heart started to beat quicker with excitement and I felt a tear in my right eye. I said to myself the tear was just from the air conditioner blowing on my face, but my heart told me differently. 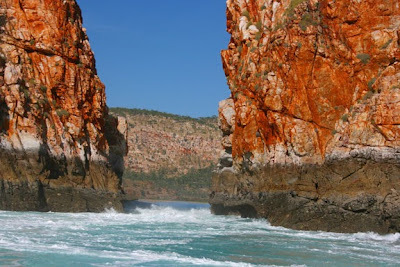 Horizontal Falls is a natural phenomenon caused when a fast moving tidal flow through two narrow, closely aligned gorges of the McLarty Range, located on Talbot Bay. The direction of the flow reverses with each tide change. As the tides in the Kimberley can reach 10 metres, a peak tide gives rise to a significant difference in the sea level on either side of the gorge. Landing on water is obviously a totally different sensation than landing on tarmac. As the floats touched the water there was a slight bounce and then it was sort of like sitting on a water bed with just a slight wobble from side to side. We then taxied up to the pontoon and climbed out of our little plane onto a pretty extensive pontoon. While we waited for the tides to be at the optimum time we checked everything out. Then we were asked if anyone would like to put their bathers on and hop into the tanks and watch the sharks being feed. At first I was a bit dubious but when I saw how safe they looked I didn’t hesitate. The Tawny Nurse or Sleepy Sharks were actually fed in a separate tank next to were we where. Although I must say even with wire and some Perspex between us, I was still a bit scared when the came really close to us. Then it was time to sit down for our very tasty egg, bacon, rolls, juice, tea and coffee breakfast. 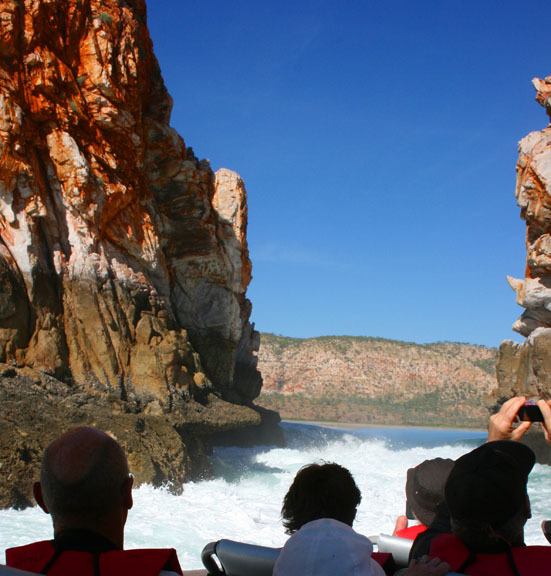 Finally the announcement was made that we could all make our way down to our Jet Boat named Full Throttle, for our ride through the Horizontal Falls. I think I almost ran to get my life vest on and board the boat. I almost sat in the front but thought it best I didn’t because I didn’t want to get my camera wet – I didn’t care about me getting wet. As we slowly approached the first and widest, although it was only 20 metres wide, opening I could see the water pouring through the gap causing a huge swell. We sat in the raging water for a while with the motor in forward but not actually getting anywhere due to the force of the water being pushed through the narrow opening. Then he gave the 900hp engine a push and off we went surging our way through the washing machine like swell, up the horizontal falls and once again in calm water. The boat then turned and back through the washing machine we went again. We did this about three times and then it was off the check out the second opening, which is a lot narrower, only 10 metres wide. If the first one was a washing machine I haven’t got a word for the second. The water coming through the small opening was as fierce as any water I have ever seen. Under different conditions we would have gone through this gap but the difference in height from one side to the other was about three metres and it just wasn’t safe enough to take us through. Although we drove up really close and definitely got the feeling of the power of the raging water. At one stage I felt that little tear in my right eye again although this time he had a friend in my left eye and I knew my heart was correct. Then we went for a nice quiet cruise across Talbot Bay, into Cyclone Creek and back again. The scenery along the river was nothing short of spectacular. 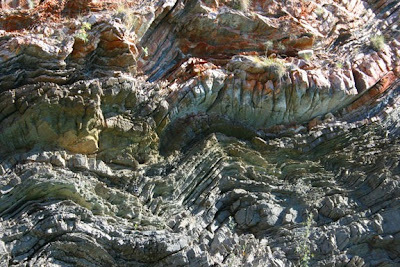 The sandstone cliffs along the river and Cyclone Creek resemble a chunk out of yummy baked Lasagna. The lines have been formed over millions of years of tectonic plates moving under the surface. Once back at the pontoon it was time to board the sea-plane again and head back to Broome. The flight back was ½ an hour longer. As we took off from Talbot Bay we continued flying low over the many many island of the Buccaneer Archipelago, Cape Leveque, Lombadina, Beagle Bay, Willie Creek Pearl farm, Cable Beach and Broome township prior to landing. . It is such an amazing part of the world and even more spectacular from the air. 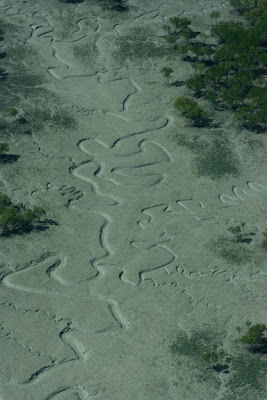 The artistic designs nature had drawn into the mud flats during the huge tidal changes was amazing. Then before I knew it I was back in Broome sitting in Myrtle reliving my amazing morning. My very special experience had me a bit speechless and it wasn’t until now I could write about it. Such a WONDERFUL story, Davine! It was like opening a book that you had written - there is wonder and magic and such JOY resonating throughout your whole story-telling. THANK YOU. I'm inspired by YOU, your lovely story and your amazing experience. 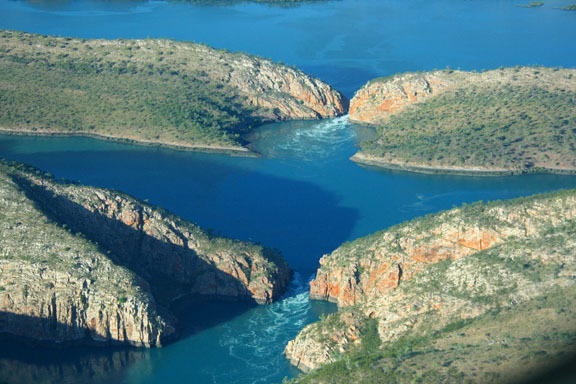 Horizontal Falls is now on my bucket list, too! Thank you Michelle, It was certainly a day I will never forget. And I can see why it took a while to absorb all of this Davine! I thought you would be 'riding the rapids' here not going against and up them!! That must have been something else!! The landscape is breathtaking I see. A great dream/wish to fulfill. Congrats! Thank you Jim - I sometimes can't believe how lucky I am to be living the life I am. I'm so excited you've achieved your dream and written so beautifully about the day!